The infamous bright yellow 30 can block of XXXX Gold. Along with the mighty Barramundi, it’s the symbol of Northern Australia. The emblem of the tropics. Unmatched in its universal prevalence for beer drinkers in the Top End, yet for most southerners it’s a complete mystery. How can a conventional, mid strength beer served in an unfashionable can be so pervasive in Northern Australia? Nothing can explain it. It’s one of the greatest mysteries of mankind. Well, it was. 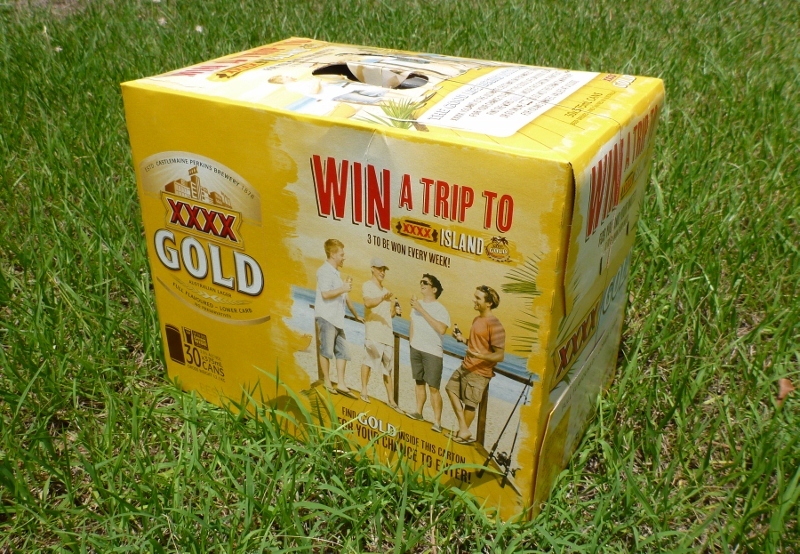 Any visitor to the Top End of Australia will ask themselves why XXXX Gold beer is so popular. 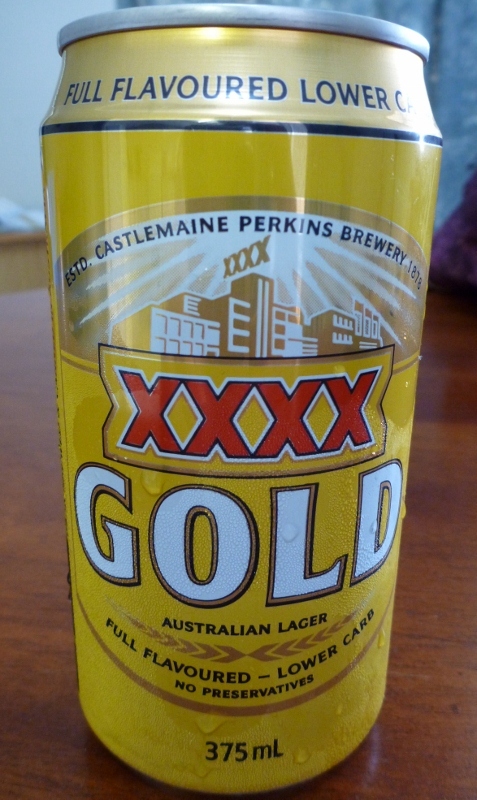 Bogans and yobbos love XXXX Gold. You would have seen them carrying a 30 can block on their shoulders around towns in Northern Australia. You would have heard Cold Chisel playing loud and clear as you passed housing in Northern Australia with empty XXXX Gold cans strewn across the front yards. But bogans aren’t responsible drinkers who consume mid-strength beer to restrict their alcohol intake, are they? Similarly, professionals and white collar workers universally quench their thirst with XXXX Gold in the top end of Australia. Trendy middle class people don’t go for cheap beer in a can do they? According to my initial thoughts, the market for XXXX Gold shouldn’t even exist. Bogans and yobbos want full strength beer and trendy middle class drinkers want trendy beer. How can it dominate the top end so much? What a conundrum. I was baffled. Living in Katherine with the wife working and me living a life of leisure, I took it upon myself to solve this great mystery. I conducted extensive research during my time living in the top end. Research including talking to XXXX Gold drinkers, drinking large quantities of XXXX Gold myself and drinking other beers to compare findings. For a long time I was puzzled. Drinkers gave ambiguous feedback such as “it’s the best beer” or “nothing else compares.” The taste was good (it’s beer) but not good enough to explain its total dominance. Sure it’s cheap, but no cheaper than other main stream mid strength beers. Its ability to get you drunk is the same as any mid strength beer and much poorer than full strength beer. Why is it so popular? Did people in the top end have shares in XXXX Gold? Was there some sort of potently addictive drug, in addition to alcohol, that was being added to XXXX Gold to ensure universal consumption? Was there a conspiracy at play? Having already invested in huge quantities of this mysterious beer, I wasn’t going to give up in my search for answers. Here I am conducting XXXX Gold research. I was extremely thorough with my experimental method. I drank whilst unshaven and unshowered and whilst wearing a singlet, stubby shorts and no shoes to help ensure the most authentic research results. For months I drank XXXX Gold and considered the problem at hand. Sittin’, drinkin’, thinkin’. That was my typical day. Of course the dishes won’t be done and dinner won’t be ready when I’ve got such important research to perform. Seeking the truth about XXXX Gold became my passion. My obsession. Much to my wife’s dismay the house became cluttered, dirty and smelly and I suffered from malnutrition and hygiene problems. Such was the sacrifice I was willing to make in my relentless pursuit for the truth. I thought if I drank enough, the answer would come to me, but for months I had nothing. No leads. No ideas. I thought the mystery would remain unsolved. The truth seemed impossible to grasp. Then the build up to the wet season set in. Man it is hot up here in the build up. Approaching 40 degrees every day with high humidity levels. There’s no relief. It’s relentless, every day is the same. As the build up to the wet season progressed I found myself commencing my research earlier and earlier in the morning. Prior to the hot weather, I closely adhered to the lunch time cutoff rule. No beer before lunch. As it warmed up, beer o’clock became progressively earlier and earlier. As beer o’clock approached sunrise and the weather got hotter, the mystery of XXXX Gold slowly unraveled itself to me. It was like the early morning fog slowly lifting as the sun rises after a cold night. It was like a hangover from a full day of drinking slowly dissipating as you commenced drinking the following day. Actually it was exactly like that. The earlier I drank XXXX Gold, the clearer it became, until suddenly, after a day of extreme heavy beer consumption following several previous days of extreme heavy beer consumption, I had perfect clarity. I had the answer. It’s so hot and humid in the build up and wet season, you need to constantly consume cold drinks at all times of the day just to survive. You can’t drink soft drink. You’d die from extreme sugar intake. The only alternative is beer. If you are living in the oppressive heat of the tropical top end during the build up and wet season and you want to stay alive, then you need to drink cold beer. You need to start drinking it soon after sunrise and continue well after sunset. If you want to be able to survive and stand up at the same time, then you need to drink mid-strength beer. There is no alternative. Even alcohol hardened yobbos understand that. Full strength beer would see you pissed as a fart before lunch. After just a couple of full strength beers you start to feel sleepy and dehydrated in the extreme heat. So mid-strength beer is a must. All that’s left to decide is which mid-strength beer. XXXX Gold is the natural solution. You see, XXXX Gold is like what Corona is to full strength beers. It’s like what Solo is to lemon squash soft drinks. It’s mildy flavoured, inoffensive, refreshing, and you can slam it down fast. So thanks to these unique characteristics and the extreme heat of the top end, XXXX Gold has evolved to become the powerhouse beer of Northern Australia, dominating the market across all classes of drinkers. Recently it has even overtaken Victoria Bitter as Australia’s most popular beer. Amazing. So there you have it. A great mystery solved. As I finish writing this article from my hospital bed awaiting an emergency liver transplant, I feel content with my persistence and investigative skills having ultimately resolved one of the greatest mysteries the world has ever seen. A mystery that many before me had failed to solve. A mystery that was labeled unsolvable. If I survive my cirrhosis and brain damage, it’ll be worth it. Yeah looking forward to your visit, we’re super excited, xxxx gold for all. Was driving between Derby and Broome one day with a quiet senior Czech engineer. He tried to find some common conversation and said he was born near Pilsna home of the best beer in the world, Pilsner. I replied that I thought XXXX was the best beer in the world. He didnt talk to me for an hour after that which I thought was fine LOL. I’m really hoping Coopers Mild Ale will take over that swill called Gold :). Coopers Mild Ale actually tastes somewhat like beer LOL. Given that Mild Ale is the official beer of the V8 Supercars series, surely bogans and yobbos will take to it. Mild ale is my beverage of choice when I’m in prison working for the man with mid strength only policy. It’s quite delicious and is also a proper sized 375ml bottle. Coopers Mild Ale is horrid!!!! A thick seedy yuck yuck then try and drink it in the heat. Dry reaching just thinking about it!!! I like it. Tastes like beer. That’s Gold mate! “Pun intended” nicely researched with an absolutely perfect conclusion. Well played. Thanks mate it’s good to get some positive feedback, not many people care about all that arduous work I did drinking beer.